Minister Michael Ring and TD Hildegarde Naughton with member's of the Oranmore Men's Shed. Government funding of more than €26,000 has been approved for equipment upgrades and minor works at men’s sheds across Galway city and county. The money has come through the Community Enhancement Programme. A total of 19 men’s shed organisations in the city and county will receive support under the scheme. 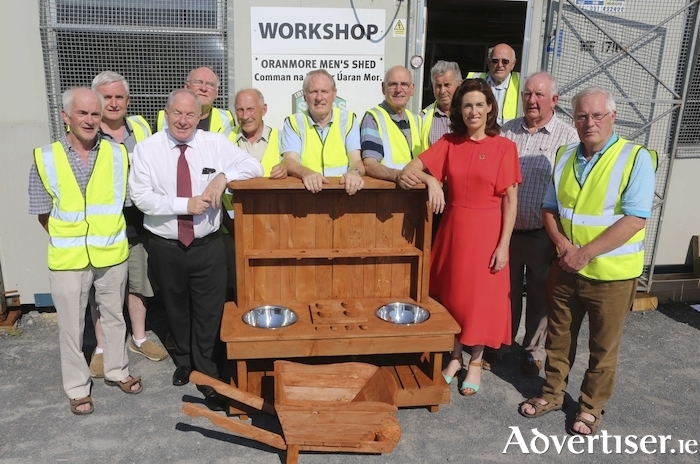 Oranmore Men’s Shed has been allocated funding to cover an outdoor area, and purchase equipment for members’ projects. Salthill Men’s Shed was approved funding for woodturning equipment; Shantalla Men’s Shed was allocated funds towards the provision of a disabled toilet in its new workshop. Croí na Gaillimhe was granted €2,610 for furniture and a boiler; while Cumann na Bhfear on Sandy Road received almost €1,450 towards a beekeeping biodiversity site; Ballybane received funds for tools and equipment; Oughterard has funds for work benches and shelving; Roundstone received funding of €1,250 towards a polytunnel and the development of garden space for members. The funding has been welcomed by Fine Gael Galway West TD, Hildegarde Naughton. “Men’s sheds are very valuable and increasingly popular facilities, which not only offer important support and amenity to their own members – but also help other organisations to do good work in their communities,” she said. “They bring people together in a setting where they can share their skills, connect with people in their communities, and use their collective and individual abilities for important projects that help others."